Dear Cork: Your Fate is Sealed! I recently drank an Austrian wine and had NO idea how to open the stupid thing. Apparently this glass, cork-lookin' device is called Vino-Seal or Vino-Lok. 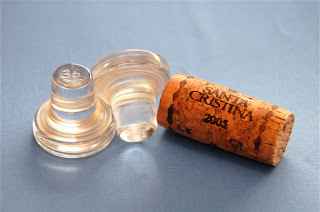 It comes in either glass or plastic form and is "uncorked" by pushing up on it with your thumb to release the seal. The cool thing about this "cork alternative" is that you can actually pop that sucker right back on top of the bottle to seal it back up. Of course it won't take out the air that's already inside, but at least it will prevent your wine from spilling out while storing in the fridge, under a car seat, or in your purse. So what's the deal with this thing? Will this be the new face of the old cork we've come to know and love? How would you feel opening your next bottle of wine without a corkscrew? Would it be the same? For me, I hope the cork doesn't ride off into the sunset anytime soon... there's just something about uncorking a bottle of wine that just feels so GOOD! Plus the cork allows some exchange of air thus helping the wine to age. Wow. That's different. As for resealing, what do you use (do you ever have any leftover wine)? We have a vacu vin and really like it. That's a good point Mark! I wonder how this enclosure affects aging? Does that mean that a bottle stored with a Vino-lock will age much slower/longer? How long does your re-sealer buy you? There is another point to using cork. Cork is natural, and most of it comes from the cork trees that are planted in Portugal. So the other point is that many birds are coming to the Alentejo where most of the cork trees are and if we don't use cork, there will be no trees and of course many of the birds will suffer too. For re-sealing, I use The Corker (http://thecorker.com/) It looks quite similar to this Vino-Seal only it uses a real cork, tapered so it'll fit any bottle. It gets such a tight fit, you can lift a full magnum by just the Corker without risking it drop (I usually keep an extra hand on the bottom, though, just in case!) I've found between the stopper & the fridge, a bottle will keep at least 3 days, sometimes 4 or 5. Not sure how long the wine can last. We usually use it up in the first couple of days or I'll plan what I cook around the wine and use the rest for cooking but the vacu vin works really well. I bet they mention that in the product details. That's pretty cool David! Do you use anything to remove the air or it just such a tight fit that it lasts anyways? Good question. I've been baking today (not my fave thing to do) and didn't really think of what we would have for dinner and don't feel like venturing out to go to the store with all of the snow. Will be digging through the freezer in a bit to see what I can find. You guys live large in Florida. I was thinking spaghetti. LOL! Nah, we're just lucky enough not to have any snow standing in the way between me and the grocery store! :) Spaghetti actually sounds pretty good too! Do you do yours with a meat sauce? I bet you have an awesome recipe! I recently had one of these glass enclosures in an Austrian wine I had at a local restaurant. It is an interesting enclosure, though I don't foresee it taking over. They still remain a rarity. Cork and screwcaps are the main contenders, and I don't see the Vino-lok breaking into that crowd, or being more than a rare curiosity. I have not seen any studies either on whether the Vino-Lok is good for aging wines. Plus the expense of the enclosure is an issue. You're probably right, but I have to admit that I like the vino-lok better than a screwcap, but I would also have to admit that I don't think I would want to be the one covering the additional overhead to have it! Sineann has been using these for years. Check our their website for their opinion. Personally, I like the screwcaps, though I've been shown it isn't as green as I once thought. I just like the convenience. The 2007 Kilikanoon Killerman's Run Cabernet Sauvignon we enjoyed last night was enclosed with a screwcap. At least my favorites, the bubbly, will always be under cork. I just can't imagine a replacement for that particular application. I'm with you... screwcap, bottlecap, or vino-lok, in the end it doesn't affect the TASTE for me... but there's still something about a good ol' fashioned cork that I love! If you are in the market for a wine sealer, check out the metrokane "rabbit" brand. Its the vacuum sealer/pump out the air with the rubber stopper. If we don't finish a bottle, it usually keeps the wine drinkable for another 2-3 days, depending if its red/white, and the quality. That's pretty cool! How would you say it compares to other wine sealers? I would love to do a sealer challenge: open several bottles, seal them with different gadgets and see which one taste best longest! I guess my love for the cork is based less on the tangible and more on nostalgia. One of wines many draws for me is the sense of history that comes with it. The idea of opening a bottle of wine in the same manner it has been done throughout history. Wine is one of those rare things in life, like all other forms of artistic expression that have the ability to transport you tio a place or time and envoke feeling. I think the history of wine and the simple processes that accompany it (like uncorking a bottle) all help to orchestrate that experience. I am with you on this one... the cork has a close place to my heart! There's just something about that feeling of uncorking a bottle that is so romantic to me. Do you think as generations of wine drinkers become more exposed to alternative closures, people will fade away from the traditional cork? I am of the younger generations of wine drinkers and for me the passion of the process (from earth to grape, from barrel to bottle, from bottle to glass, from glass to good cheer)is what gives me a feeling of connection to generations past. The cork is a part of that.